Ben Hendrie receiving his certificate from Phil Stephenson. 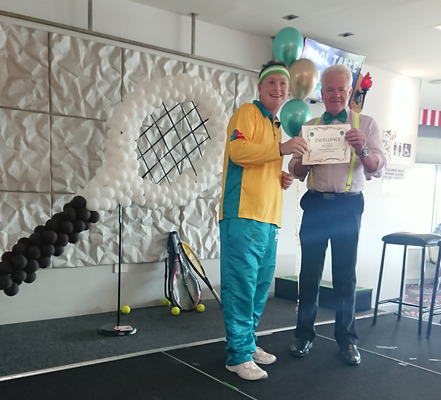 Tewantin Noosa RSL held a ‘Day for Benny’ on Thursday 11 April celebrating Ben Hendrie’s achievements in tennis at the Special Olympics. Ben has been employed by the Club since 2010 and does a great job of waiting on tables in the Bistro and keeping the furniture clean. Ben also plays tennis, really well. So much so that he was selected to play tennis for the Special Olympics held in March in Abu Dhabi. Ben ranked fourth in both the singles and doubles and has medals to support his accomplishments. The Tewantin Noosa RSL Club have supported Ben is his tennis career in the past and CEO Phil Stephenson presented Ben with a Certificate of Acknowledgement and Appreciation from the club for his accomplishments. The certificate was accompanied by $100 towards Ben’s future tennis equipment needs. A giant tennis balloon was fashioned by Mr Jay and Miss Donna balloon artists and the club was decorated in green and gold and the staff donned the Aussie colours in support of their co-worker. The club also donated $2 from every sale of Ben’s favourite meal, chicken schnitzel which raised $300 to go towards Ben’s chosen charity, Road Trauma Services.